Do You Like to See Advertisements on Webpages? Unlike many, I like to see ads on webpages I visit. I don’t understand why people consider ads to be irritating or distracting. I generally give half-a-second for any ad to interest me, maybe less. If it doesn’t, I’ll shift my focus. I can easily ignore ads I don’t want to see. Of course, I should admit that certain ads, like the ones they put on Youtube — see this 30 second ad and then we’ll let you see your 3 minute video (or) see this ad and you’ll be directed to the content later — are irritating indeed. Because they block the content and force me to see an unrelated advertisement (mostly). I don’t like pop up/pop under kinda ads — fortunately I don’t see them much nowadays. I don’t like websites where a video ad starts playing once I enter — they create unnecessary noise and waste my bandwidth. In fact, since I don’t watch TV or read newspapers much, I come to know about the latest products/services only through Internet website ads. Sometimes, the ads are even informative: I can learn when the IPL is going to start, when an interesting event is going to happen in my city, when a new movie/book/music album is getting released, etc. Some ads are contextually relevant and useful. If I am reading an article on Air Conditioners and I see an interesting offer/ad for an AC, obviously I’d be interested to know more. Sometimes, my browser “remembers” which sites I’ve visited and displays ads from exactly those companies. Actually, I don’t mind the tracking part, but why advertise a service that I’ve rejected in the past, again? That maybe irritating, but sometimes I am glad to rediscover something I forgot, or see it in a new light. So it depends. I read that an ad-blocker becomes a bestseller and is withdrawn because ‘its success doesn’t feel good‘. I find it amusing that a paid ad-blocker has even become a bestseller in the first place. Are people getting *too paranoid*? It seems, in the future, ad networks can track you to the extent that they’ll be able to guess what you will want next (before you even realize it yourself) and advertise that. That’s the reason I don’t want to block all ads. I have already mastered the art of selectively watching only those ads I want to see. And I want to see some! How about you? 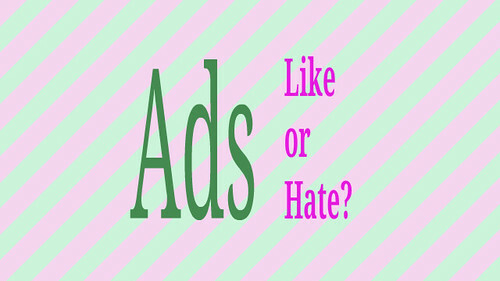 Do you like or hate ads? Very interesting post. I have never paid any attention to ads on either on TV or in print mrdia. Ads are a necessary nuisance. Na I dont like ad’s .. because i feel sometimes they grab more attention then the page we are visiting..
That’s true. I feel ads should add to the value of the post, than hijack the post itself. That generally happens with unrelated un-targeted advertising. I like them when I am in a mood to see them…there are certain that irritate me to the core. Good that you like them though! I hate reading newspapers these days because of the advertisement… nowadays mostly first page is quite dedicated to ads and even on the main page ads take half the place and I lose the interest in reading as i feel lazy to flip back those pages. When it comes to webpage, except the pop up the ads aren’t disturbing me anymore. But I happened to reinstall my laptop because of the pop up ads and when all ad blockers failed to remove them… and even reinstalling browsers doesn’t work. I don’t mind ads in written material like webpages or blogs, but it’s really annoying on TV when you have just reached the interesting bits of the movie. I guess any ad that distracts us deliberately from the content is annoying. Ads should ideally be an extension of the content — contextual advertising. That’s true. I guess ads are more effective that way.